BCA 2018-2019 Friday Pizza Lunch! Welcome back, BCA families, new and returning! Each year, we run a Pizza lunch on Fridays for our students, which is a great way for us to fundraise for improvements to BCA! Your pizza lunch helps keep BCA a thriving and exciting place to learn--and let’s not forget: this is one day a week that you are NOT making a lunch. Pizza Lunch Orders are due September 26, 2018. Please do separate orders for each child. Even if you have more than one child ordering the EXACT same items on the same days, please do their orders separately. Late orders cannot be processed. Forgot what (and when) you've ordered? NO PROBLEM. Log into our order desk and check your order, using the email you used when you ordered. A login password will be emailed to you. All flavours of popcorn can be purchased at all recess periods throughout the week for $2 a bag! That's right! A lunch you don't have to pack! Think of it as a mini-vacay. HAPPINESS IS: NOT PACKING A LUNCH ONE DAY A WEEK! We've grouped ordering options: a la carte, simple combos, and hungry options. If you wish to order more than ONE slice of pizza at a time, look at the hungry options! ONE slice, ONE drink etc? look to simple combos. ONE order per child please! To make lives easier for our wonderful volunteers, the orders are grouped by grade level. If you are ordering a la carte and wish more than one of something (for example, 2 slices of pizza for each date), add the quantity of slices at the checkout and the price will be recalculated. 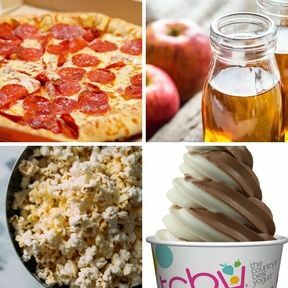 This year we have cheese, pepperoni, gluten-free pepperoni, and veggie pizza from Pizza Pizza, Kernels Butter salt popcorn bags, and TCBY chocolate/vanilla Swirl Cups. For beverages: apple juice and fruit punch!